Harriet Beinfield and Efrem Korngold are the authors of many articles, a best-selling book, and several guides. Here is a list of their published writing – some of the articles are available as PDFs on this web site. 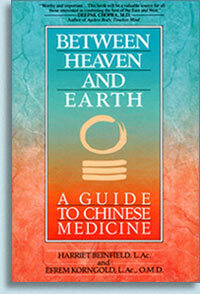 Between Heaven and Earth: A Guide to Chinese Medicine, New York: Ballantine, 1991. Chinese Modular Solutions Formula Guide, San Francisco: Chinese Medicine Works, revised, 2015. 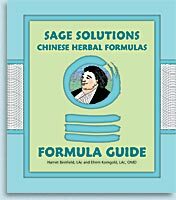 Sage Solutions Formula Guide, San Francisco: Chinese Medicine Works, revised 2016. Gentle Warriors Pediatric Formula Guide, San Francisco: Chinese Medicine Works, 2006, revised 2014. Chinese Medicine: How it Works, San Francisco: Chinese Medicine Works, 1991. “Chinese Medicine and Cancer Care,” Complementary and Integrative Medicine in Cancer Care and Prevention, edited by Marc S. Micozzi, MD, PhD, Editor, Springer, 2007. “Dao and the Doctor: The Thought and Practice of Chinese Medicine,” Seminars in Integrative Medicine, 2003: 1 (3). “Chinese Medicine and the Mind,” Explore: A Journal of Health & Healing, July/Aug 2006, Vol 2, No 4. “Chinese Medicine and Cancer Care,” Alternative Therapies in Health and Medicine, Sept/Oct 2003, Vol 9, No 5. “Centralism vs Pluralism: Language, Authority, and Freedom in Chinese Medicine,” Clinical Acupuncture & Oriental Medicine, (2001) 4. Foreword, Chinese Pulse Diagnosis: A Contemporary Approach, Hammer, Leon, Seattle: Eastland Press, 2001. “Dreaming with Two Feet on the Ground: Acupuncture in Cuba,” Clinical Acupuncture & Oriental Medicine, (2001) 3. “Overview of Clinical Acupuncture,” Integrating Complementary Medicine into Health Systems, Gaithersburg: Avon, 2001. Foreword, Who Can Ride the Dragon, Ken Rose and Zhang Yu Huan, Brookline: Paradigm Press, 1999. “Chinese Medicine and Digestion,” Optimal Digestion, New York: Avon, 1999. “Menopause, Hormones and Chinese Medicine,” Oriental Medicine, January, 1999. “Conversations: Eastern Medicine for Western People,” Alternative Therapies, 1998: 4 (3). “Revisiting Accepted Wisdom in the Management of Breast Cancer,” Alternative Therapies (Co-Author with Malcolm Beinfield, MD), 1997: 3 (5) (1997 Award for Clinical Scholarship from Alternative Therapies). “Cracking the Code of Chinese Medicine,” Natural Health, November, 1996. “Fleas, Ponies, Doctors, Angels,” Acupuncture in Practice: Western Case Studies, edited by Hugh MacPherson with Ted Kaptchuk. London: Churchill Livingstone, 1996. Foreword, Medicinal Mushrooms, Christopher Hobbs, Santa Cruz, CA, Botanica Press, 1995. “Chinese Medicine: Five Archetypes,” Shape, May, 1995. “Chinese Traditional Medicine: An Introductory Overview,” Alternative Therapies, 1995: 1 (1). “New Remedies for Old Ills,” USA Weekend feature article, 6th Annual Health Issue, January, 1995. Foreword, Treating AIDS with Chinese Medicine, M.K. & A.D. Shattuck, Berkeley: Pacific View Press, 1994. “Performance-Enhancing Herbs, sidebar: Chinese Tonic Herbs,” Natural Health, May-June, 1994. “Chinese Remedies,” New Age Journal, January-February 1994. “Chinese Herbs – Harnessing the Forces of Nature,” Health Food Business, July, 1992. “Chinese Herbal Medicine: When Echinacea and Goldenseal Aren’t Enough,” Delicious, May-June 1992. “Kitchen Doctor – Cooking with Chinese Herbs” and “Menopause,” Natural Health, March-April 1992. “Charting the Currents of Qi,” Heartland Journal, November, 1991.